This collection features various boxed/retail copies of old software and operating systems. 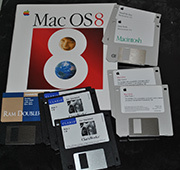 Items in this collection include OS/2 Warp 3, Microsoft Windows 3.1 (both 3.5" and 5.25" versions), MS-DOS 4.01, Microsoft Windows 95, Windows NT 4.0, MacOS 8, MacOS 7.6, MacOS 7.1 install disks. 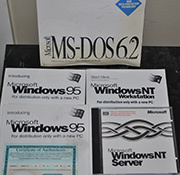 The Microsoft collection contains a number of goodies including Windows NT 4.0 Workstation, Workgroup Add-on for MS-DOS, Windows 3.1 in two different box styles, MS-DOS 4.01, Windows 95 (pre-sale OEM upgrade pack). We do also have a large quantity of MSDN CDs with developer copies of many Microsoft applications. Further expansion of this collection will likely include older versions of Windows NT as well as MS-DOS versions up to 6. 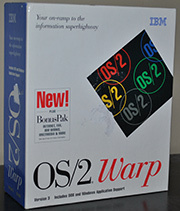 While we do have an archive of several versions of OS/2, one of our users was kind enough to donate this boxed copy of OS/2 Warp version 3 to us. Also included was an original purchase receipt indicating a cost of a couple hundred dollars. We have not yet had a chance to install OS/2 for testing and demonstration, but this will be looked into in the future. We have a decent selection of original install media for MacOS versions including system 6, 7.0, 7.1, 7.5, 7.6, and MacOS 8. Much of this was obtained by purchasing used Macintosh computers and all the original accessories from people looking to upgrade. The 7.5 install disks were obtained directly from Apple in the mid 90's using a loophole - Performa owners did not receive install media with new systems and could request Apple mail a copy. This is just a small collection of OEM license certificates included with some old systems we claimed from corporate hardware recycling. This includes keys for Windows 95, Windows NT Server and Workstation, and also MS-DOS 6.2 OEM install media. 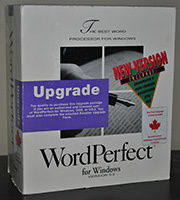 We do also have various other boxed software including the pictured WordPerfect 5.2, as well as some other Macintosh games and utilities. This collection also includes older driver media for PC/Mac hardware from the 80's and 90's.